Hephaestus was the God of the Forge. He was the patron of smiths and craftsmen, and his work was beyond compare. 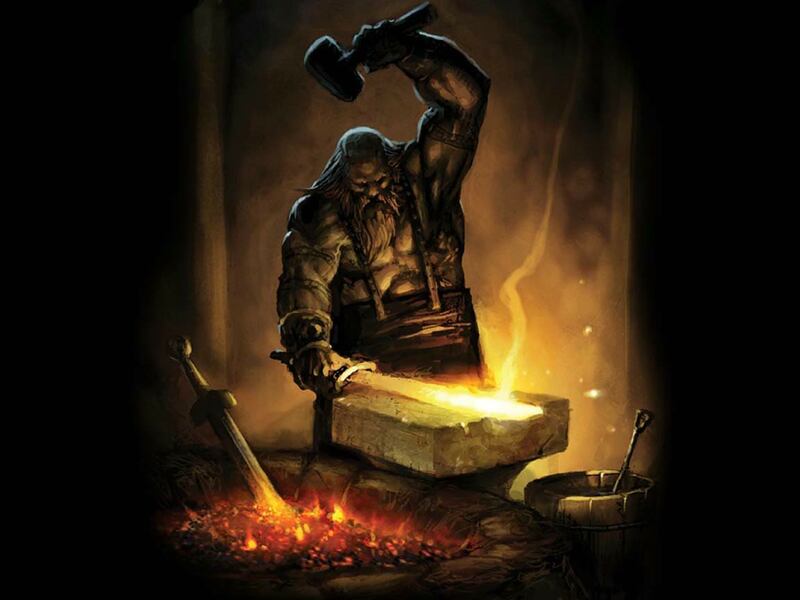 His forge was said to reside in an immense volcano, which would spew out molten lava as he worked. As such, he was the God of Fire as well as technology. He was the son of Zeus and Hera, but it took a while before they accepted him. Hephaestus was born with a lame foot, and his parents were ashamed of his deformity - and their son. He was also an amazingly ugly baby. To keep anyone from realizing his birth, the infant was disposed of, dropped from Mount Olympus. He fell for nine days and landed in the ocean where he was cared for by two ocean nymphs: Thetis (the future mother of Achilles) and Eurynome. He grew up under their tutelage and quickly demonstrated his prowess in metalworking and smithcraft. Once the Olympian Gods realized what Hephaestus was capable of, they welcomed him back and asserted his divine status. He was treated with great respect and Zeus gave him a magnificent forge. In return, Hephaestus forged thrones for all the Gods, and each was a marvel in and of itself. In fact, Hephaestus' status was such that he was even given the most beautiful of Goddesses as a bride: Aphrodite, Goddess of Love. Although he was more than satisfied by this union, she was not. It was something that was a source of unhappiness to Hephaestus, but he dealt with it by putting much of his emotion into his craft. Most of the famous weapons and armor used by Gods and heroes were once created by Hephaestus. Zeus' Thunderbolts, Hermes' Winged Boots, and Helios' Chariot are all said to be his work. In addition, Hephaestus also created arms and armor for Achilles, Perseus, and Theseus, to name a few heroes.